I picked up an advanced copy of The Ivy last month at BEA. I had seen it pop up on GoodReads awhile back and flagged it as interesting in that it's a YA take on the whole Ivy League experience. So when I was offered a copy at BEA, I grabbed it and stuck it in my bag. And, given how much I enjoyed Diana Peterfreund's Secret Society Girl series, it seemed only fair to give this similar series a go. Written by best friends and former roommates at Harvard themselves, Lauren Kunze and Rina Onur, I like the simplicity of the cover and, having read it now, the deep red over the wrought iron gates definitely hits the right tone for this dishy delving into the outrageous underbelly of freshman year at Harvard. I started this one while still in New York and finished it on the plane ride home. It reads fast and furious and is the first in a four-part series following a humorous and diverse cast of characters. Word is each installment in the series will take place a few months apart, following the seasons and natural divisions of the school year. Callie Andrews has just landed at Harvard. Hailing from sunny California, she's not your typical Ivy Leaguer and she got there honestly on the strength of her grades and diversified extracurricular activities rather than the length of her pedigree or the degree of her parents' wealth. The adventure starts on moving day, when Callie meets the three other girls who will be her roommates for the duration of freshman year: Vanessa Von Vorhees, Dana Gray, and Marine Aurelie Clement. And their names pretty much predict exactly what you're going to get from them. That same day she also meets the boys next door. Literally. Greg, Matt, OK (short for Okechuwuku), and Adam. Things get off to a rocky start to say the least, as Callie doesn't feel like she really fits in with any of the motley group. Then her longtime boyfriend Evan dumps her via a poorly worded email. And the implosion doesn't stop there. It seems young Evan made a few ill-advised mistakes when they were back home in Cali and they may just come back to bite Callie just when she's trying to make a fresh start in a new environment where the slightest social faux pas can ruin your chances of making it out of Harvard alive. Her roommates rally around her in her time of need, but there's one person on campus who has it in for Callie Andrews, a person who will annihilate anyone opposition. For a moment, she could see nothing but his eyes. The color was irrelevant (blue, if you must know), but the expression was magnetic: intensity masquerading as indifference, the look carried a challenge--Entertain me, or I will entertain myself at your expense. His mouth twisted in a smirk so natural she had to assume that this was its default expression. Even in silence, he appeared to be mocking her. Callie felt her cheeks grow hot. "Oh--uh--yikes," she stammered, bending down and shoving her bras and underwear back into the box, cringing as she reached for her smelly shin-guards and wishing, for once, that she had listened to her mother ("The doctor said no more soccer for at least a year: do you really think your shins are going to need guarding in college?"). Instead Callie had insisted, a tad bit dramatically, that they were the closest thing she had to a teddy bear (seeing as she slept with them on the night before every big game), and without them she was like a warrior without his armor, at which point Theresa Frederickson-Andrews, no, make that Theresa Frederickson (it'd been three years since the divorce but she still had to remind herself), threw up her hands and shook her head, muttering the oft-repeated phrase, " . . . just like your father." In a way, though, it was true: without soccer--a busted ACL put her out of commission at the end of last season for possibly forever--she wasn't quite sure who she was anymore. Thankfully old Scott Bugers Wentworth had also promised as rapt--raptly asleep that is--audience had lapsed into a collective heat coma on graduation day that "College is a primetime for reinvention." So far, it was looking like she had a jump start on redefining herself as the Dorm Klutz. "I'd offer to assist you," said the box-droppingly handsome Reason-for-the-mess, still watching with poorly concealed amusement and looking like help was the farthest thing from his mind. "But usually I like to buy a girl dinner or at least a drink before I handle her undergarments." Callie is a very normal girl who struggles, somewhat ineptly, to deal with the ridiculous academic and social expectations put upon her the second she passes through the hallowed gates of this place. For the first half of the book I just went with the flow, laughing out loud several times, and letting the snarky writing tug me to and fro. After that the predictability (and petty) meter started shooting off the charts and I felt anxious to get to the inevitably unresolved ending. The lack of substance was getting to me. This is a four-part series after all, though it seems to me as though it's really one crazy adventure divided into four books. In the end the reading experience reminded me strongly of a modern-day, college version of The Luxe series. It's a sea of hormones, backstabbing, ambition, and flailing freshmen. And, even though my investment level ended up on the low end, it was a breezy, raucous read and I liked the last guy Callie kissed the best. For those interested in a more in-depth, sophisticated, and charming version, I cannot recommend Diana Peterfreund's Secret Society Girl series highly enough. 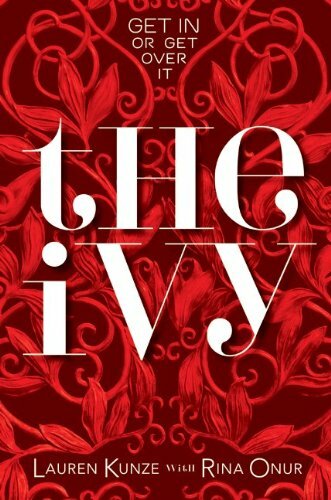 The Ivy is due out August 31st. I had seen this one and had wondered if it was gonna be like The Secret Society Girl series too. I'd be interested to see how the series progresses. Thanks for the review. I only got an e-ARC of this, and won't be getting an eReader before the release date...too bad! I picked this up at BEA as well and wasn't sure how high up I should put it on my TBR pile. Thanks for the review. The beginning sounds fun, but I think I'll hold off. I miss the Secret Society Girl series! Thanks for the review. I'll certainly have to check this out at the end of August. Michelle, yes, it would be interesting to see if book 2 continued on in the same vein or if the kids matured a bit. Lenore, yeah, I got the e-arc and then ran across a hard copy. Britt, my pleasure. Hope you get a laugh out of it. I miss Poe... :( Now I really want to read this!